Declines in violent activity linked to Boko Haram and al Shabaab are balanced by increases in the Sahel, generating a mixed picture of the challenge posed by militant Islamist groups in Africa. 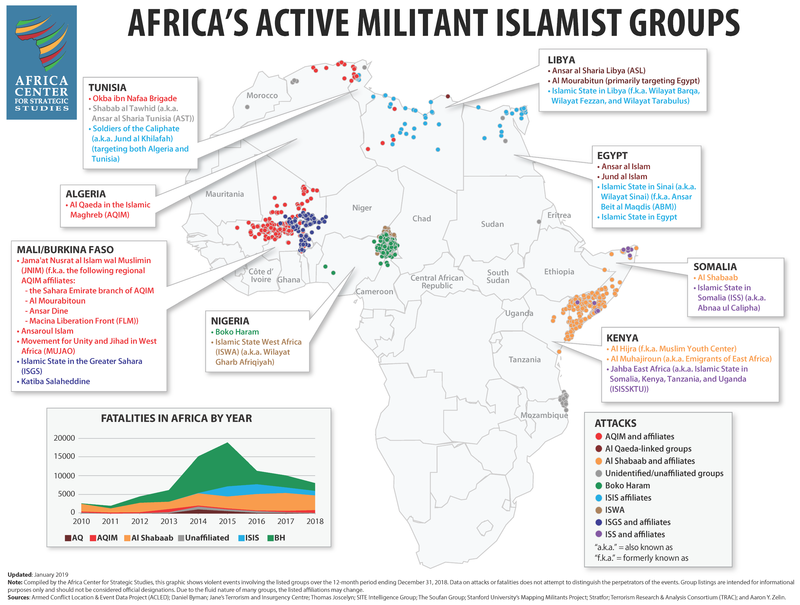 Militant Islamist group activity in Africa remains primarily concentrated in four theaters: Somalia, the Lake Chad Basin, the Sahel (Central Mali and border areas), and Egypt. However, the number of groups active in these theaters has been growing, largely due to splintering. Thirteen African countries are facing regular attacks by militant Islamist groups, roughly equivalent to the previous year. Reported fatalities linked to militant Islamist group events declined by 12 percent to 9,347 in 2018. This continues a 3-year trend and is a 50-percent drop from the 2015 peak of 18,728. This primarily has to do with a decrease in reported fatality numbers linked to Boko Haram (a 35-percent drop), as well as al Shabaab (15-percent drop) and ISIS (21-percent decline). 2018 saw a 25-percent decrease in violent activity linked to Boko Haram (444 events versus 595 in 2017). However, events linked to the Islamic State West Africa (ISWA), which splintered off of Boko Haram, more than tripled (83 events versus 27 in 2017). Likewise, fatalities linked to ISWA increased almost 58 percent to 687. This compares to 2,052 violent deaths linked to Boko Haram in 2018. Al Shabaab saw a 7-percent decrease in reported activity from 2017. However, the 1,515 violent events linked to al Shabaab still represent more than 3 times the number related to Africa’s next most active group, Boko Haram. Likewise, reported fatalities linked to al Shabaab accounted for almost 42 percent of all reported fatalities involving militant Islamist groups in Africa in 2018 (3,955 out of 9,347). Meanwhile, events linked to the Islamic State in Somalia (ISS) rose from 34 in 2017 to 49 in 2018. AQIM’s Sahelian affiliates showed the greatest escalation of activity in 2018. The number of violent events related to these groups doubled: from 144 in 2017 to 322 in 2018. Reported fatalities related to their activity rose more than two-thirds: from 366 in 2017 to 611 in 2018. Meanwhile, 2018 saw a rapid expansion in the theater of conflict for this region – from north and central Mali to parts of Burkina Faso and Niger. In Burkina Faso, activity related to AQIM affiliates and the Islamic State in the Greater Sahara (ISGS), rose from 24 to 136 in 2018. In Niger, violent events linked to the same actors grew from 5 to 29 in 2018. ISIS activity in North Africa remained roughly equivalent to 2017. The reported fatalities linked to ISIS, however, dropped from 1,478 to 1,170 in 2018. ISIS’ affiliate in Egypt’s Sinai accounted for 82 percent of all reported violent events linked to ISIS in Africa (283 out of 344 events). 2018 also saw the growth of militant Islamist activity in northeastern Mozambique. Called by locals “al Shabaab,” the group has been linked to 55 violent events in 2018 and 164 fatalities.